There was a time when Doug Henning roamed the earth, a time designated B.C. (Before Computers). It was a time when armed only with an Olivetti portable typewriter, a deck of cards and a dream of unseating Max Maven as the inventor of more damn card tricks and sleights than anyone else in history, I devised many, many effects, some really awful with short life spans ("Spanish Inquisition," lie detector with Ascanio spread), some acceptable but dated "the "Disco Deck") and some I thought would be utilities that would live on in eternity, or at least until an asteroid destroyed earth. This manuscript is in the last class typed on the trusty Olivetti and illustrated with tracings of Richard Kaufman illustrations I assembled from completely unrelated and different effects (when I told Richard this years later he thought I was nuts to go to this much trouble). A very small portion of this manuscript does appear in Harry Lorayne's book, Best of Friends Volume II (pp. 415-433, but space limitations there did not allow for the fuller explanation the ideas require (especially the very unique way the Snake effect is performed). A great many of the effects in modern card magic depend upon cards in packets being exchanged and/or added to other cards. Ed Marlo's ATFUS move, Fred Braue's Secret Addition Move (also known as the Braue Add-On Move) and J.K. Hartman's Secret Subtraction Move are in constant use in a wide variety of effects and methods. A related group of moves are those which switch one group of cards for a completely different group of cards. For example, see the switch described in Le Temps Four Aces at page 248 of Expert Card Technique . The methods used within the various groups and between the various groups are all different and accordingly how the moves appear to a spectator differs. If consistency is a goal in handling, then in achieving that goal a consistent handling should be developed for all types of switches and transfers. Subtract no cards from the packet. Subtract a portion of the cards from the packet. Subtract all the cards from a packet. Add no cards to the packet. Add some number of cards to the packet. The Packet Transfer Switch. ( PAT Switch ) can accomplish all of the above possibilities for a packet of cards consisting of from 3 to 5 cards where it is desired to add and/or subtract from 0 to 5 cards. In addition, the method is the same in all cases, so that the various switches appear to the spectator as the same series of actions. Four Aces can be switched for four Kings as easily as four Aces can be switched to three indifferent cards and an Ace. Another advantage of the PAT Switch is that no table or get-ready is required. Accordingly, it is perfect for the stand-up performer. 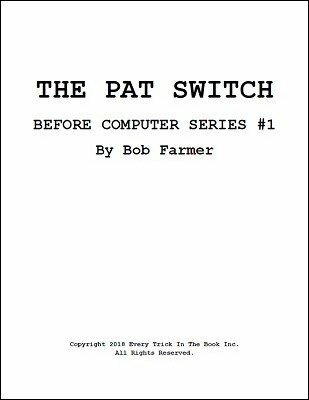 The PAT Switch completely minimizes packet and deck contact and the necessity for showing the cards to be switched twice (i.e., once when they are removed from the deck prior to the switch and once when they are displayed during the switch). The move is incredibly versatile. In fact, there are 87 different kinds of subtractions/additions possible. All of the variations are set out in the manuscript. No other single switch can accomplish so much. Lastly, the move is angle-proof and can be done close-up and surrounded. Two red Aces and a Joker are removed from a deck. The three cards are fanned and the magician invites the spectator to take part in a small monte game. The three cards are held face down and the Joker is openly and slowly placed between the two red Aces. With no moves whatsoever, the Joker magically jumps to the top of the packet. Once more the Joker is slowly placed between the two red Aces and once more it magically jumps to the top of the packet. The magician says that he will make the monte even easier to follow. The Joker is placed face-up between the two face-down Aces. But now the cards have lost their faces: all three cards are shown to have backs on both sides. Suddenly the Joker makes its appearance: but now all three cards are Jokers. One of the Jokers visibly turns into a King and when the two remaining cards are turned over they are discovered to have turned into Kings also. The three cards are left on the table and the Joker is produced from the magician's pocket.